Anne Ramey (in her Norse dress with beaded festoon) and her husband Ray Ramey dressed as their SCA personas Jehanette de Provins and Refkell Melrakki Einarsson. The Fosston Fiber Festival 2015 featured instructors on various fiber art techniques, including Anne Ramey, the instructor who taught netting. While at the festival, Anne met one of the vendors, Julie Hart, a lampwork artist from Indiana who had her handmade glass beads for sale. 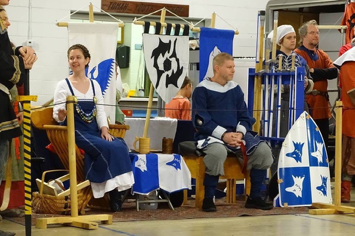 Anne is involved in the Society for Creative Anachronism (SCA). Through her research for the SCA, Anne knew that Viking period dress included glass beads used as a festoon (up to several strands of glass beads, small tools and other embellishments that hung between brooches worn on the shoulders of a woman’s dress). 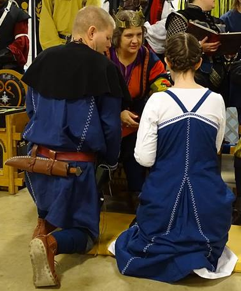 Working with Julie, Anne was able to recreate an accurate dress with festoon to wear at a Crown Tournament event with the SCA. This meticulously handcrafted dress, including beads, will be on display at the Fosston Fiber Festival October 1-2, 2016. Below is an interview with Anne about her involvement with the SCA and the dress and costumes she makes and an interview with Julie Hart about bead making in Viking times and how this differs from the modern methods. Hart: “Different colors are produced by different metals, such as copper, silver, gold. One technique for producing decorations on a bead is done now just like the Vikings would have. I wrap the bead in gold or silver foil, encase it in clear glass and then put it back into the flame. This keeps the heat from burning the foil off the bead. Anne Ramey has been a member of the SCA for about 16 years and takes much pleasure in the Arts & Sciences part of the SCA world. She creates all her garb (clothing) and strives for a good amount of historical accuracy. She enjoys the research part of this as well as doing the costuming, weaving, braiding, embroidery and netting. Because there is always so much going on in the SCA, she is able to learn something new from others. For the last number of years, she has also counted herself among the "enablers" who have been fostering others to learn new arts and grow in the society. Julie Hart is a lampwork bead artist who has been working with glass since 2005. She uses a wide range of techniques that she has honed through classes with several noted outstanding artists. Anne Ramey will be teaching a beginning inkle weaving workshop on Saturday, October 1 and a beginning netting workshop Sunday October 2. Julie Hart will be a vendor at the Fosston Fiber Festival again this year. For more information about the festival or the artists and instructors, see fosstonfiberfestival.com or 218-657-2502. Ray and Anne Ramey in their SCA personas and Viking costumes showing the back of the Viking dress.